Oh, hey! I made another pattern in pale, blushy pink, which I happen to think is perfect for these lovely ladies. I found these drawings while cleaning out my sketchbook and decided they'd be better together as a pattern. I've been fighting the urge to use pastel pink SO HARD you guys. But, I've finally caved. I had taken a 20-year hiatus from using the color out of efforts divorce myself from all things girly. But, now that I've re-embraced the color I've gone a bit overboard. It's like a whole new world out there! With all the light pink items I've amassed I could pretty much dress head to toe in pale pink. I bought Glossier skincare probably 99% for the pale pink packaging alone. Rose Quartz is the Pantone color of the year, after all so, maybe it's okay? Tell me it's okay. I've lost all restraint! I've developed a serious pastel color crush in the past few years. I used to be so against pastels. But, the older I get—and the more chaotic my life gets–the more soothing I find a good pastel color palette. I would guess you see only about 1-5% of all the design that designers actually do. There are so many scanned sketches, unused Photoshop layers, half-illustrated Illustrator documents and a mountain of revisions that sit lonely in a junkyard of forgotten file folders. I remembered a set of brushstrokes I made that weren't quite right for a recent project. I hate to let them sit lonely and forgotten, so I tinkered with them a bit and now they're seeing the light of day. Here's my second pattern attempt, which I'm affectionately titling Mixed Metallic Macaroni. I've really been into mixed metallics lately and curved lines, so I felt compelled to mix the two. It's serious business, this one. If you'd like to know more about the Pattern Progression series, read my introductory post. I've been having trouble sleeping lately (thanks pregnancy insomnia) and have been spending a lot of time in front of the computer trying to wrap up client projects before this baby decides to show up. I've been listening to a lot of podcasts to keep me company and have been going through the Elise Gets Crafty series. I love Elise's upbeat, positive and creative outlook. Two of her podcasts really stood out to me recently: Making Time to Make with Emily Jeffords and Maintaining a Creative Habit with Crystal Moody. As I mentioned with my goal for 2015 I'd really like to ensure that I'm continuing to be creative despite the tiny, adorable whirlwind that's about to hit our family. So, how to do that amid chaos? I keep coming back to that question. It (literally) keeps me up at night. Awhile back, I got really inspired by patterns and started making a few patterns/abstract illustrations of my own. And then, life and client work just got in the way and I quit. I hadn't thought much about it since. After hearing about Crystal Moody's commitment to making one drawing/painting every single day, I got to thinking, "Surely I could make one pattern a week. She makes something every. single. day." I know in actuality amongst spit up and toddler chasing and client work, it won't be easy. And, I know that I also just resolved not to make any big resolutions and focus on just adjusting and finding a new way. Internet, I can almost see you shaking your finger at me. Don't worry, I'm shaking a finger at myself too. However, I started the 52 series last year for photography and never finished. Gasp. I don't regret it. I learned a lot about photography in the process. The learning along the way was worth the failing. So, even if I fail again at finishing this year, I know I'll learn something more about patterns and design and illustration and all those loves as I go. So, here's my first attempt, pattern progression number 1 of 52. It's been forever since I've made a good old fashioned potato stamp. It felt great to just play around with paper, paint and potatoes for a bit. I think I'm going to keep things loose and call designs that don't necessarily repeat patterns. I'm already behind, so I'm going to allow myself grace to post late. Look at me, cheating already! Update: I've been given a suggestion to make this into a series that others can participate in. If you're interested in exploring print/patterns, you should definitely join in on the weekly creative challenge. It'd be great to see others participate. If you do, please send me links to what you're doing. This pattern post is brought to you by June gloom. I guess it's not as much a pattern as it is a grouping of expressive brushstrokes demonstrating my general distaste for the continuing rain in our weather forecast. Or, something like that. Lately, I've really been in the mood to break out the paint brushes and experiment with more color. This is much different from my typical palette of black, grey and cream. Regardless, I've decided I'm just going to go for it, and see where it takes me. Illustrating these made my stomach growl (and hands hurt). They're illustrated in the simple, graphic style that I tend to feel most comfortable working in, but they were also a challenge as I added in more dimensionality than I usually do (some of the detail is lost due to web quality). This meant more time spent at the computer trying to work out the complexity. I should apologize to my poor eyes and hands. 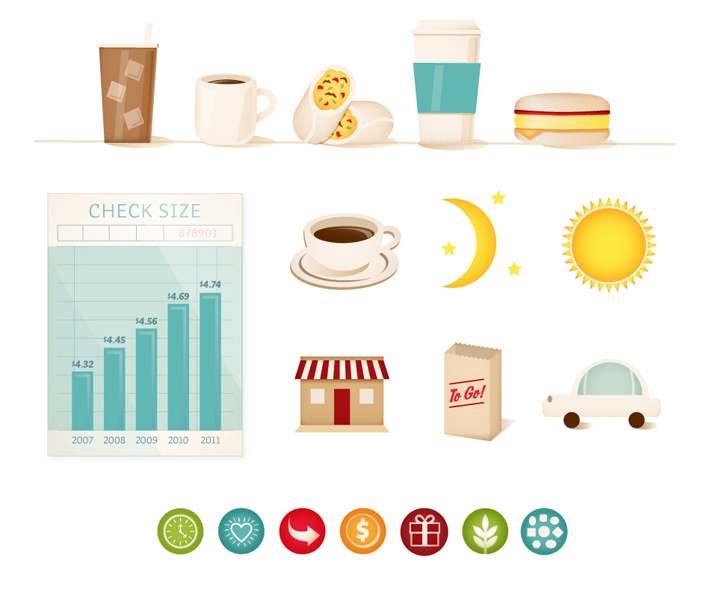 These illustrations were done for the client Otis Spunkmeyer, a baked goods company. They were featured in a few pieces about the rise of trends in the breakfast and snacking categories. I'll take an iced coffee and breakfast burrito to go, please.